Don your best Rosie the Riveter look and head for WWII Home Front National Historical Park. 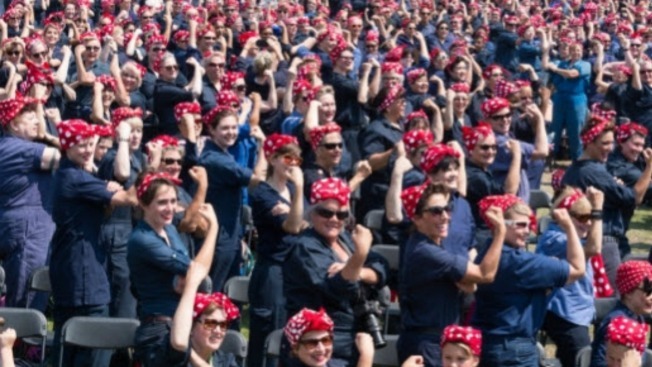 People gather at the Rosie the Riveter Trust in Richmond in August 2015 to set the Guinness World Record for having the most people show up dressed as Rosie the Riveter in one place. Want to try in 2017? Be there on Saturday, Aug. 12. HOMEFRONT FESTIVAL AND ROSIE RALLY... at the Rosie the Riveter/WWII Home Front National Historical Park is the setting for an annual Guinness World Record attempt. It's when Rosie tributers gather for "The Largest Gathering of People Dressed as Rosie the Riveter," and the Saturday, Aug. 12 event is going to be gargantuan, as is tradition. Well, it has to be if it is to break the 2016 record (and, yes, "defend" it, too) of 2,229 Rosies appearing in one place. Own a red polka-dotted kerchief? Some denim? Are you ready to flex some muscle? Here's the information you need, Rosies. The heart-gladdening day isn't solely about the historic snapshot, though; the Homefront Festival includes the appearance of Franklin D. Roosevelt's yacht the Potomac, as well as plentiful exhibits, kidly activities, vintage vehicles like a '40s-era bus, and "an air craft cockpit display from the USS Hornet." Food truck vittles and live sounds fill out the jubilant come-together, one that honors the mighty icon and all that Rosie still so dynamically represents.